Monster Energy Aftershock has announced its official lineup featuring Stone Temple Pilots, Deftones, Bush, Chevelle and many more. It will take place in Sacramento CA on Sunday September 23rd. For full lineup and ticket information read more. First annual Monster Energy Aftershock festival has announced its official lineup and ticket information. The festival will take place in downtown Sacramento California in Discovery Park. Tickets are prices at $49.50 and a VIP special for $99.50. 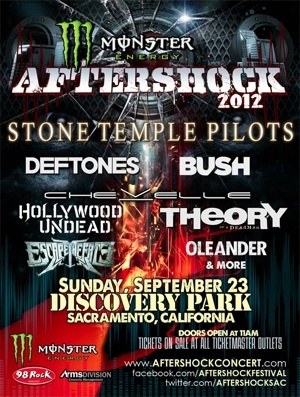 Tickets can be purchased at Aftershock Festival’s website or on Ticketmaster.